The Jazz put together segments of solid play in Sunday's playoff opener in Houston, but turnovers and cold shooting doomed Utah to a lopsided 122-90 loss to the Rockets. "There's got to be more determination to not have empty possessions," Jazz head coach Quin Snyder said after the game. "We had some moments where we did. It just wasn't consistent enough." 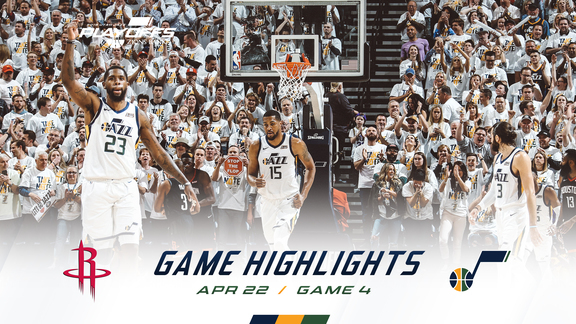 Rudy Gobert led the Jazz with 22 points and 12 rebounds, while Donovan Mitchell (19 points), Ricky Rubio (15 points, six assists, two steals) and Derrick Favors (13 points, six rebounds) also scored in double figures in the loss. The Jazz fell behind by as many as 17 in the first half but cut that margin to five midway through the third quarter thanks to a 17-7 run. Three turnovers and three wide-open misses from three, though, led to 10 quick Houston points. The Rockets controlled the game from there, outscoring the Jazz 39-19 in the fourth quarter to seal the Game 1 victory. "Our inability to secure a rebound or a loose ball when we did get a stop was a problem," Snyder added. 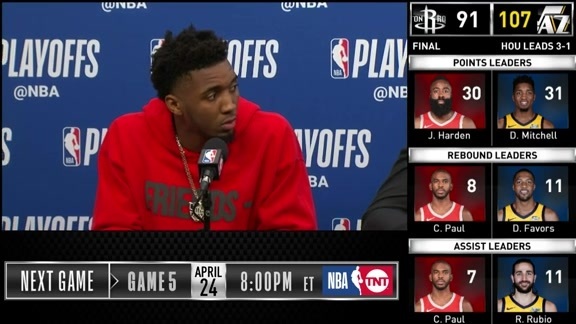 "In the third quarter when we started to play better, we had three or four possessions where we got stops, and we just had some plays offensively where not only did we not convert, we made mistakes. We turned it over. ... We didn't play well. I guess that's what I'm trying to say." The Jazz shot only 39.0 percent from the field, including 7-for-27 (25.9 percent) from beyond the arc. The Rockets shot 50.5 percent overall and 15-for-41 (36.6 percent) from three. James Harden led Houston with 29 points (on 11-for-26 shooting), and he added eight rebounds and 10 assists in 33 minutes. Clint Capela double-doubled with 16 points and 12 rebounds, while Chris Paul chipped in 17 points in the victory. 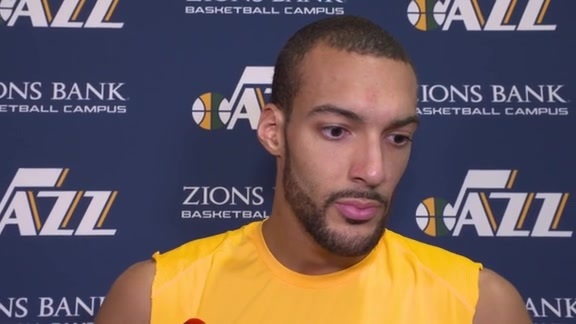 Gobert was efficient on offense (8-for-10 from the field, 6-for-6 from the line) and imposing on defense with 12 rebounds and a block. After finishing the regular season with 66 double-doubles (No. 2 in the NBA), Gobert logged his 13th career postseason double-double (in 20 games). Besides the gap in shooting percentage (50.5 percent for Houston, 39.0 percent for Utah), the Rockets also had a 95-77 advantage in shots taken. Utah's 19 turnovers (compared to 12 by Houston) and the Rockets' eight offensive rebounds contributed to that disparity. Utah's bench struggled mightily, shooting a combined 4-for-26 (15.4 percent) in the loss. Jae Crowder finished with nine points on 1-for-9 shooting, and no other Jazz reserve scored more than three points. Joe Ingles finished with only three points on 1-for-4 shooting. The Jazz went 9-18 during the regular season when Ingles failed to score in double figures. 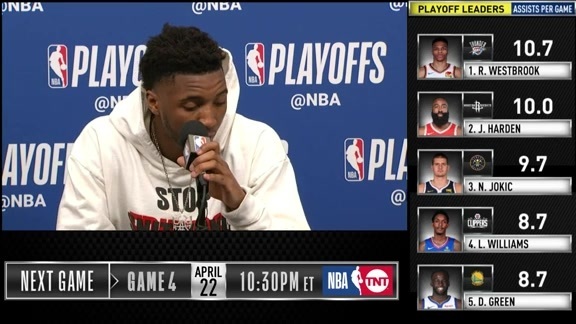 "You're going to give something up against the Rockets. We just don't want to make it easy. We had some breakdowns in the half court, no question. Some of that is going to happen even when you're good, because of their ability to make plays." Kyle Korver (knee soreness) was only able to play 10 minutes, and he did not register a shot attempt. Korver, who had missed Utah's last six games, finished with two points (both on free throws). ... Danté Exum (knee) was also out for the Jazz. ... Houston outscored Utah 62-42 in the paint. ... The Jazz shot 23-for-27 (85.2 percent) from the free-throw line. Houston shot 11-for-12 (91.7 percent). ... The Jazz now have a 22-23 all-time postseason record against the Rockets. The Jazz will stay in Houston for Game 2 on Wednesday night. Tipoff is set for 7:30pm MT, and the game will be broadcast on both TNT and AT&T SportsNet.